Girls' Generation recently made a comeback with full length, The Boys. The music video of The Boys was released on October 18, 2011 in both Korean and English. 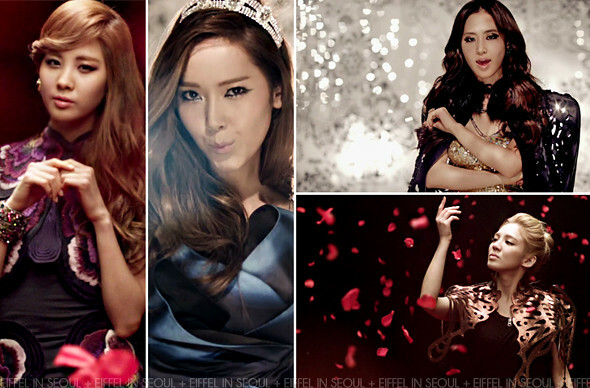 In the music video, four members of Girls' Generation were dressed in Korean designer, Lie Sang Bong's collection. Namely, Seohyun (서현), Jessica (제시카), Yuri (유리) and Hyoyeon (효연). 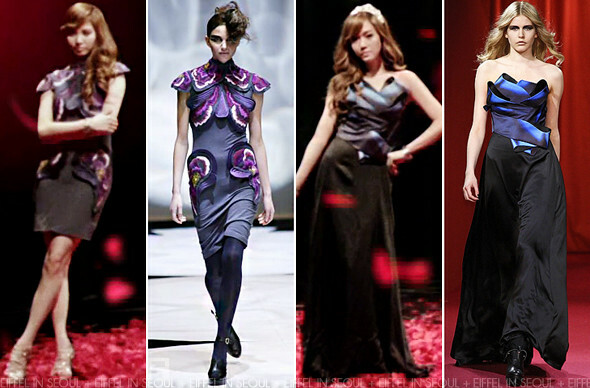 Seohyun (서현) was my favorite among the four in a stunning floral dress from Lie Sang Bong Fall/Winter 2008. I love the oriental vibes it gives off. It was fitted perfectly. Jessica (제시카) was dressed in a long gown from Fall/Winter 2011. She was definitely one of the main stars in the music video, completed with a tiara. Both Yuri (유리) and Hyoyeon (효연) was wore the cut out outerwear/cape from Fall/Winter 2009. You may remember seeing Kara's Hara (하라) wearing same outerwear in Lupin album cover.